An amazing hall with l000 seats. It was almost full which was a huge compliment - we were up against a one-off Mozart birthday concert at the State Theater. 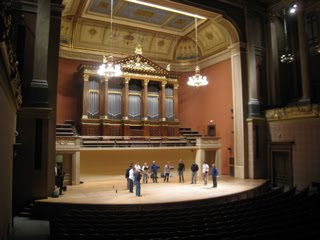 The Rudolfinum acoustic is a legend among musicians - it's unbelievably warm and allows an incredible range of dynamics - all the effects we try so hard to create wherever we sing just floated out. We've probably never been able to sing so softly.